Are your management styles in conflict or at odds with the overall culture of your company? This might not necessarily be a bad thing! According to a study published in the Journal of Applied Psychology, companies with relationship-based cultures, focused on teamwork and communication, did best with task-oriented or result focused CEOs and vice versa. This study used companies’ return on assets as a measure of success. This is interesting since intuitively we would think we would want CEOs to have the same mindset and focus as the corporate culture itself. It turns out that the opposite is true. Identifying discrepancies like this are one of many facets of EAGALA Model Equine Assisted Team building. What management style do you or your team have and how does it relate to the culture of your business? How does it relate to your clients? These are just some examples of questions explored during Equine Assisted Team building sessions which are held year round, rain or shine. Burnout is a real phenomenon. It affects us all. Ironically, those in the mental heath field, teaching self-care to clients, don’t always abide by their own advice. Enter the concept of mindfulness. In an article from the American Psychological Association, “Seeking More Balance,” maintaining a work-life balance is a life-long task and is much easier said than done. Some professionals focus solely on time-management in order to create balance, as with Jim Davies, PhD, a faculty member at Carleton University in Ottawa, “We’re too busy because we’re overcommitted, not because our jobs are too onerous.” He uses a strict technique of planning out every 30 minute block of his day, “Crucially, I also schedule in my breaks…including lunch, coffee breaks and even daily naps… For me, prioritizing life means putting it in the schedule like all the other important things.” On the other hand, many others don’t seem to focus solely on time management, but rather energy. Sandra Lewis, PsyD, a clinical psychology at Montclair State University in New Jersey and founder of the Living Source, said, “People focus a lot on time management, but I think in terms of personal energy management. If you have enough energy, you make better use of your time. In the same way we charge our cellphones, we need to charge ourselves.” Instead of adding on all of these self-care activities to your day that then simply seem like another item on your To Do list, “Find self-care strategies that you can integrate in rather than add on. Honor the small things,” says Lewis. Instead of picking up a new exercise class at the local gym, walk around the block on your lunch break or instead of taking a half hour nap, spend 5 minutes between meeting meditating or breathing or stretching. All of these mindfulness techniques can be utilized in many environments. We have found integrating mindfulness into our Equine Assisted Psychotherapy work with at-risk youth, veterans, families and even with our inmates. Cultivating mindfulness while being surrounded by 1,200 beings, as they connect with you and match your breath is magical. 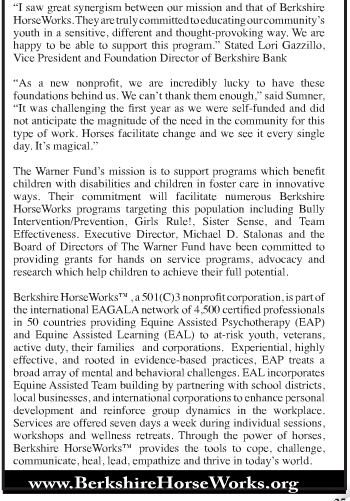 The most recent issue of “Berkshire’s Best” Bridal Guide includes an article about Berkshire HorseWorks’ first grants that were recently secured. The article (replicated in the accompanying graphics), share the entire article. To see the original article in its online form, please follow this link and find us on page 25. Overwhelming caseloads and a lack of safety training puts social workers at an exceptionally high risk. These professionals report to put their own safety on the back burner while handling a large number at cases. While the federal guidelines recommend no more than 12 cases per caseworker, caseworkers in St. Albans, VT average a caseload of 24.8. If these social workers limited themselves to the federal recommendation, the entire office would be able to handle only 60.4% of their current cases. This reveals another dilemma: a dearth of qualified professionals in this area or just budget cuts? Either way, security has shamefully faded to the background. Does it take a death of a local social worker, for Vermont’s DCF offices to establish mandatory safety training programs and protocols such as the buddy system when making home visits? Please chime in. Berkshire HorseWorks has seen nearly 200 individuals, couples, and families struggling with various mental and behavioral challenges ranging from depression, PSTD, TBI, anxiety, ADHD, trauma, addiction, autism, sexual abuse, and anger management. Our rescue horses have been there for them as they have been there for the horses. This video gives you a glimpse into the lives of these people as well as how this work has affected them, and the benefits they received from Equine Assisted Therapy. As you will hear from some of our partners and mental health professionals, this is incredibly powerful work and horses really do facilitate change. If this video has inspired you to become involved in some way, please contact Berkshire HorseWorks at (413) 698-3700 or info@berkshirehorseworks.com Of course if there is someone in your life who you believe will benefit from this work, please reach out. We would love to thank Ptarmigan Films, in particular Stephen and Derek for their hard work and creative support. In October, the United States Justice Department announced its plan to release thousands of inmates early from federal prisons. With this, comes the question, how many of those released suffer from mental illnesses, and how, as a society, and more specifically as mental health professionals, will we address their needs. Approximately one in every 100 Americans lives behind bars, according to a 2014 report by the National Research Council—approximately 2.2 million people currently reside in our nation’s correctional facilities. Out of this population, many will be released and commit additional crimes and return to the criminal justice system. Psychologists have seriously begun to look into the cause of this where intervention must occur. Ironically, despite the pervasiveness of mental illness and substance abuse in today’s prisons, there is a dearth of quality services which adequately examine the root of the behavior as well as the familial impact or other factors before diagnosing and proceeding with a treatment plan. Furthermore, those who do receive treatment are highly unlikely to either seek treatment after release or to possess the resources necessary to continue. In addition to the lack of treatment of mental illness before and after release of these inmates, there are even more basic needs that must to be met in order to ensure these individuals will not succumb to recidivism. The Risk-Need Responsivity (RNR) Model created by the late psychologist, Donald A. Andrews, PhD, of Carleton University in Ottawa, has been the leading tool in assessing the needs of inmates. It not only assesses the risks of recidivism, but also measures the broad range of criminogenic needs associated with criminal behavior. The greatest challenge is to accurately communicate and share the findings (knowledge) with certified social service professionals to ensure appropriate treatment. Fortunately, the Federal Government stepped in in 2008 and passed the Second Chance Act which provides grants to evidence based programs that aid in the reintegration, monitoring, and overall treatment of inmates. One viable evidence-based modality for these inmates is Cognitive-Behavioral Therapy (CBT). CBT is the basis of EAGALA Model Equine Assisted Psychotherapy practiced at Berkshire HorseWorks. This modality has been found to be highly efficacious with this population for its unique ability to identify and modify behavioral patterns. To read more about this topic, visit the article “Life on the Outside” featured on the American Psychological Association website. Berkshire HorseWorks™ is pleased to announce a very special fundraising event. On May 16, 2015, Berkshire HorseWorks presents the Natural Horsemanship Clinic with renowned horseman and author, Tim Hayes. 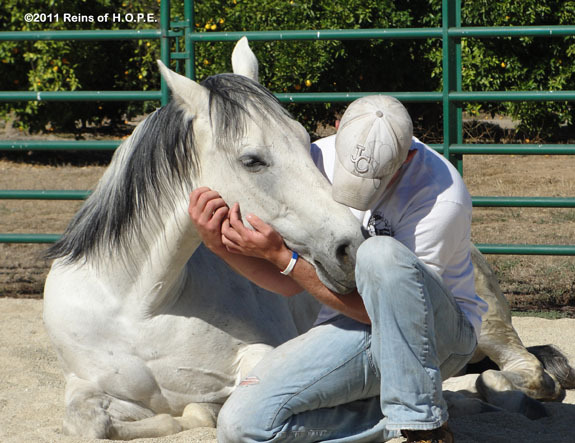 Hayes, author of Riding Home: The Power of Horses to Heal, conducts clinics worldwide and has starred in the award-winning documentary “Natural Horsemanship with Tim Hayes.” Before his career as a horseman, Tim worked in film and TV. He was a cowboy in Idaho, and began teaching Natural Horsemanship, often called “Horse Whispering,” as a riding instructor in Montauk, NY. A nationally recognized horse clinician, Tim is also a visiting instructor for The University of Connecticut and The University of Vermont. 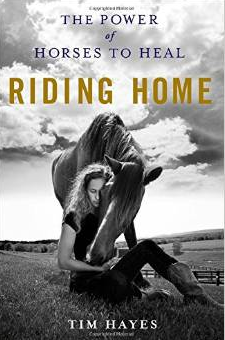 Tim’s book, Riding Home:The Power of Horses to Heal, is the first and only book to scientifically and experientially explain why horses have the extraordinary ability to emotionally transform the lives of thousands of men, women and children, whether they are horse lovers, or suffering from deep psychological wounds. The Natural Horsemanship Clinic will be held from 10:00 a.m. – 4:00 p.m. at the Berkshire Equestrian Center, Richmond, MA followed by a “Meet the Author” cocktail reception and book signing at The Inn at Richmond. Registration is available for the entire day’s and evening’s events, or for selected sessions only. All proceeds will benefit Berkshire HorseWorks, a 501 (C)3 providing EAGALA model equine assisted team building and equine Assisted psychotherapy to those in our community struggling with PTSD and related challenges. Please register by May 9th using this registration form. For questions and details, call Hayley Sumner at (413) 698-3700. Download an event flyer here. 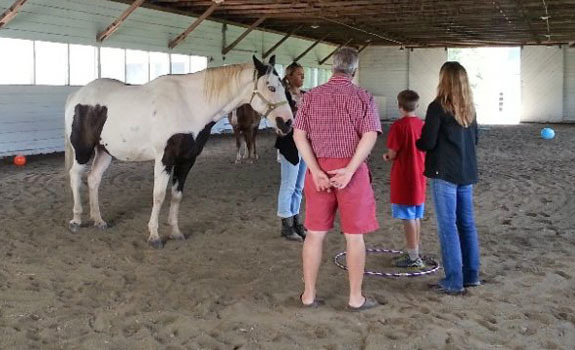 Every year, people from across the world who practice the EAGALA method of treatment, gather to learn more about the program and discuss new ways to apply the EAGALA Model of Equine Assisted Psychotherapy and Equine Assisted Learning to help others in need. Professionals come here to learn more ways to treat their patients. We were there to represent Berkshire HorseWorks. Read more about this year’s conference in this article from The Mesquite News. The photo below is from a session at Berkshire HorseWorks and is not related to the Mesquite conference. Kenny Green • The Mesquite News • March 19, 2014 – Since the Mesquite Arena opened, it has been the host to numerous events that utilize horses. A recent event involved horses in a different way. Instead of using them to race around barrels at breakneck speeds or guide wayward bulls back into their pens, these horses where being used to provide therapy to individuals with mental illnesses as part of EAGALA’s annual conference. 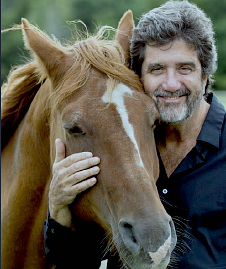 One way horses are used is for people that have faced addictions. Thomas said the person with the addiction will be asked to set up a path for the horse to follow. The path will contain various roadblocks and key points during their recovery process. Kenny Green’s entire article is available at Mesquite News. According to a new study in the Canadian Military Journal authored by Dr. Randy Duncan of the University of Saskatchewan, Equine Assisted Psychotherapy “does in fact provide real-time relief for PTSD.” The study was conducted at Can Praxis in Rocky Mountain House with 100 particpants over a one year period. 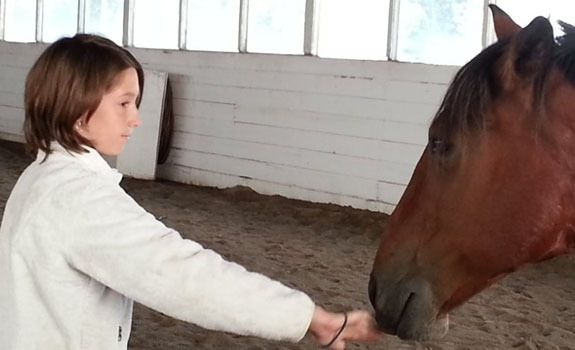 The photo below is from a session at Berkshire HorseWorks and is not related to article from 660news.com. A local program that helps Canadian veterans with post-traumatic stress disorder (PTSD) by working with horses is hoping new data will show how effective their methods are. Can Praxis in Rocky Mountain House has been in operation for a year where the horses are used to help soldiers with anxiety, behavioral issues and problem-solving. Co-Founder Steve Critchley is praising a new study in the Canadian Military Journal, which said the model is providing valuable help not only to the veterans, but their families as well. Lucas Meyer’s entire article is available at 660news.com. The EAGALA model of Equine Assisted Learning has helped thousands of children and adults around the world deal with emotional issues, anger management, coping skills and social interaction. Ethan Vaughn’s story in the Courier-Journal last week was just another reminder to all of us at Berkshire HorseWorks what seeming miracles can come from the horse/human collaboration. Families who had all but lost hope find solace and reassurance when they discover EAL and EAP. The photo below is from a session at Berkshire HorseWorks and is not related to Ethan Vaughn. Jenna Esarey • The Courier-Journal • April 9, 2014 – Last year, Ethan Vaughn’s angry outbursts and struggles with ADHD were getting out of hand. The Charlestown third-grader was having trouble focusing and controlling his behavior in school. “He’s always had hyperactivity, but things had gotten a lot worse. He was having trouble with anger,” said his mother, Kerri Vaughn. That was until the family found out about Jeffersonville’s nonprofit horse therapy group, Opening Gates Inc., that offers equine-assisted counseling and learning programs using its 19 horses. “I had heard about therapy horses, but I had no idea we had any in the area,” Vaughn said. Ethan, 9, was paired with Bear, an abused animal rescued by therapist Shara Wiesenauer, the founder of Opening Gates. “He’s 27. That would be 81 if he was a person,” she said. Jenna Esarey’s entire article is available at The Courier-Journal.